so what was martina upto now at the sunfeast open? Tennis player Sunita Rao and company sashayed down the ramp in a fashion show organised on Wednesday night for the ladies participating at the Sunfeast Open in Kolkata. The more reticent participants of the tournament sat and watched and clapped. "It was great. Kiran the designer, she made really beautiful dresses, all of them were absolutely gorgeous, so we had a lot of fun," said Sunita Rao. Designer Kiran Uttam Ghosh said, "They were really keen. They got so excited when they saw the detail and the workmanship. I think it was just the whole spirit of the entire thing, the event. They just took to the clothes so well." The whole idea was to give the visiting tennis stars a good time and a taste of India. Besides the fashion show, there was also an astrologer, a potter and even a bangle shop. Those who couldn't make it to the night before showed up this morning at the avenue of stars at a city park. Among them was Martina Hingis, who left a handprint for Kolkata to cherish forever. "An avenue of stars is what it's called. I think it'll be fun, every year will add to the mould and keep growing and it's hopefully something the city of Kolkata is going to treasure for a long time," said Mahesh Bhupathi, MD of Globosport, the company that has organised this tournament. Calcutta, September 21, 2006: Tennis icons participating in the Sunfeast Open 2006 descended on the Millennium Park this morning to unveil the 'Sunfeast Open - Avenue of Stars'. The ceremony forms part of the Sunfeast Open 2006 currently being hosted in the city. Designed on the lines of Hollywood's Hall of fame, the Avenue of Stars would be a tribute to world-famous icons in various fields. With primary focus on tennis, the Avenue of Stars will feature hand prints of famous tennis stars visiting the city in future editions of the Sunfeast Open 2006. The initiative is aimed at establishing a historical tourism spot in order to promote tourism in the City of Joy, and to consolidate Calcutta's position as India's ultimate tennis destination. The Avenue of Stars at the Millennium Park, along the banks of the Hoogly, providing a spectacular view of the Rabindra Setu (Howrah Bridge) on one side and the Vidyasagar Setu (Second Howrah Bridge) on the other, was given a glittering official opening at the hands of Mrs. Bharati Deveshwar. 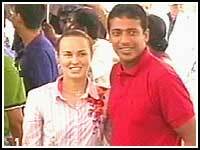 Martina Hingis and Mahesh Bhupathi were the first tennis icons to imprint their hands on the Avenue of Stars walkway at the inauguration. With the opening of the Avenue of Stars, names of Martina Hingis and Mahesh Bhupathi have been etched in the memory of the city forever. Sunfeast plans to develop the walkway with imprints of many more global icons in future. The Sunfeast Open - Avenue of Stars will be opened to the public and visitors from all over the world from September 22, 2006 onwards.